The 30th Istanbul film festival kicked off here Friday evening with an opening ceremony including some of Turkish and European renowned icons of cinema. The festival will air over 230 films from dozens of countries over the next 16 days. 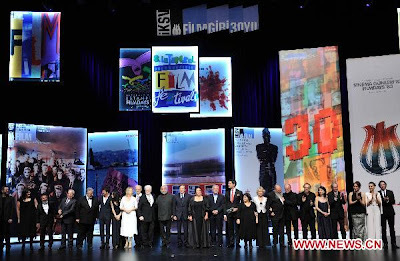 Over the course of 30 years, the festival has brought films from 109 different countries to over 3,047,000 people, making it Turkey's top film festival. The opening ceremony featured videos showing highlights from the past 30 years of the festival, and famous Turkish actors and directors took to the stage to share their own tales. The guest of honor was Hungarian director Bela Tarr, who was given a Cinema Honor Award. Other recipients of the Cinema Honor Award during the night were visual director Ertunc Senkay, actors Metin Akpinar and Zeki Alasya, and director Yusuf Kurcenli, all veterans of Turkey's film industry. Alongside films, the festival will also feature workshops and seminars as well as parallel events and concerts.